My husband loves cabbage so I use it in stir fries, cook it with butter and bacon and basically add it to anything I think it will go with, but I must admit I do have trouble finding interesting way to prepare it. Found this recipe in Mum’s collection and think I’ll try it out on him, it certainly is different. 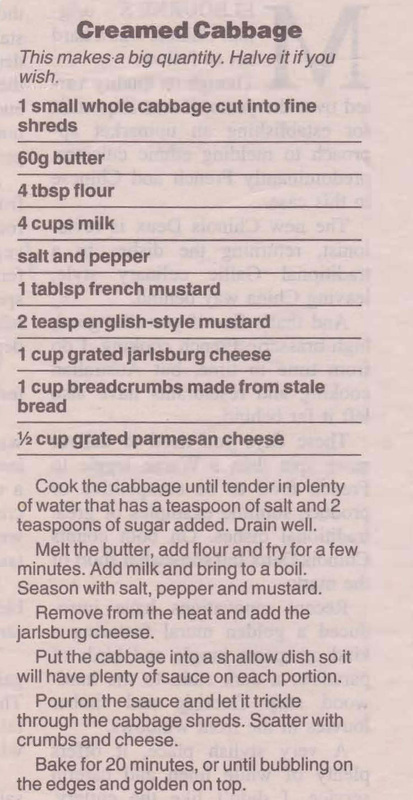 This entry was posted in All Recipes, Salads & Vegetables and tagged 2000s, cabbage, creamed cabbage, jarlsburg cheese, mustard by bebsrecipes. Bookmark the permalink.